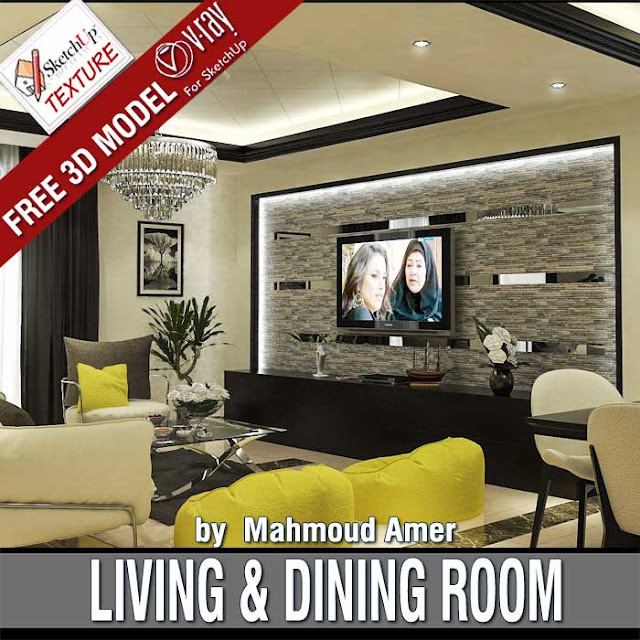 I thought I'd make you an homage by sharing with you my latest work made with SketchUp and renderd with Vray: Is a large bright living room, with a dedicated dining area. 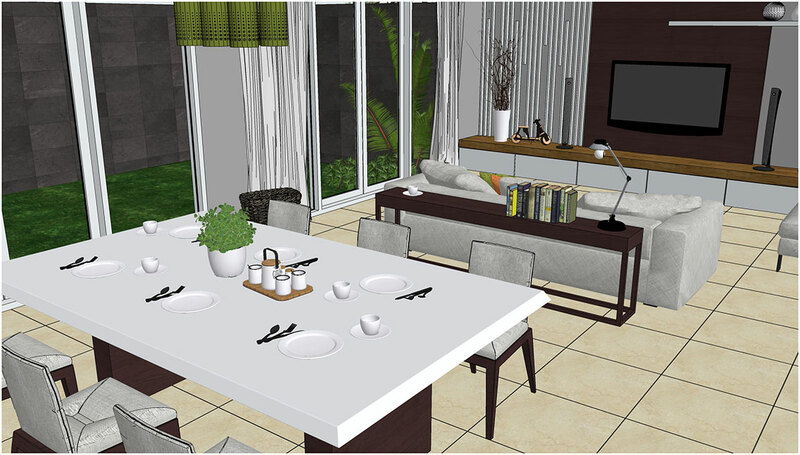 For the furniture, I used a very dark wood and to lighten the layout, I chose a cream-colored floor, while the chairs and sofas, I chose an ivory white. 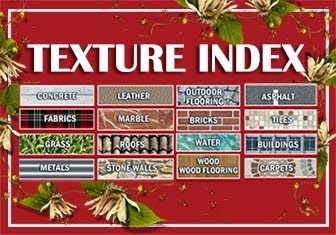 All The textures used here, are taken from Sketchup Texture Club whom I thank very much for all the awesome material that makes available to us. 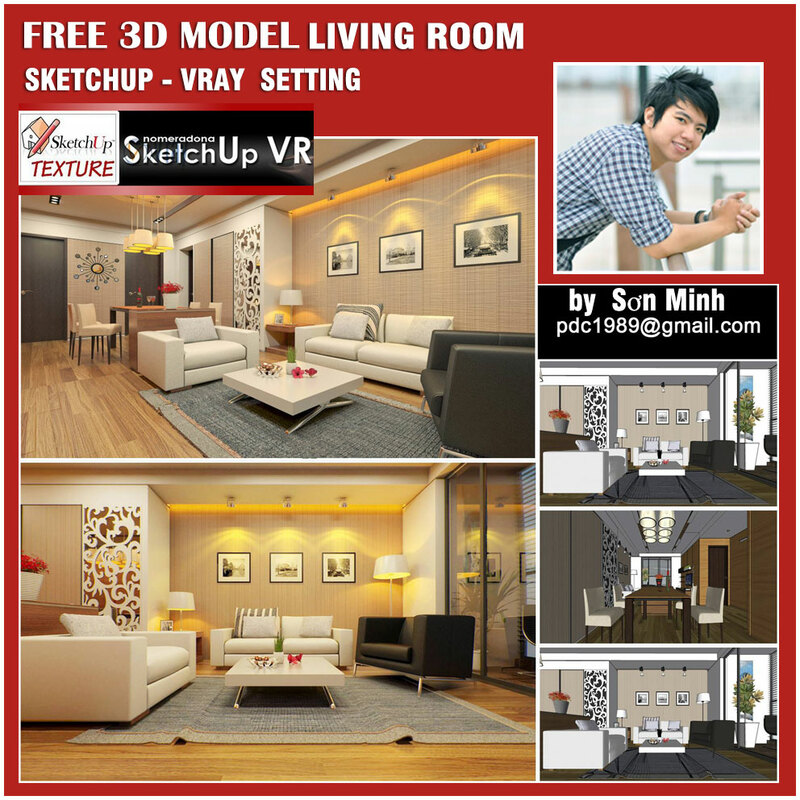 The original 3D model, was made with SketchUp 2015, but I saved the file in SketchUp 8, in such a way everyone can download it and use it for practice. NOTE: to download it you need to register. 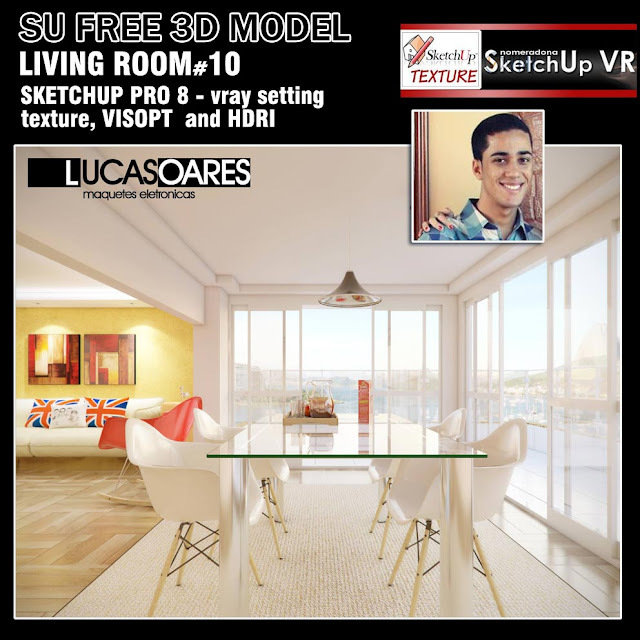 The 3d model, is made available in sketchup 8 , complete with all the textures, vray interior Visopt and all Vray lights used of this scene. 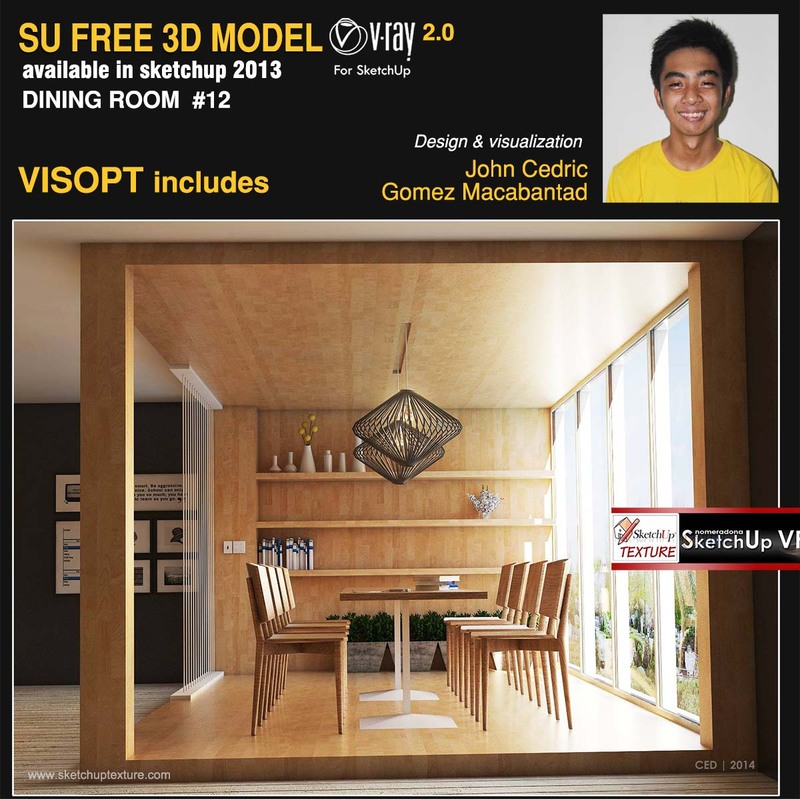 The 3d model, is available in sketchup 2013, full all textures and includes the vray interior visopt inside the file. 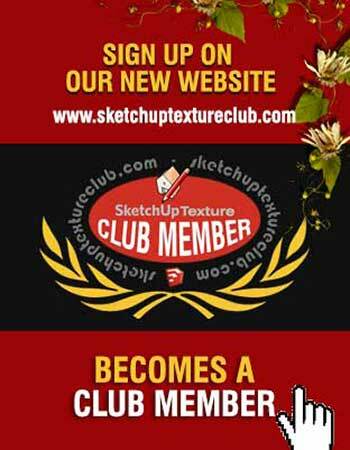 Thank you very much John for this useful contribution to "sketchup texture community" ! 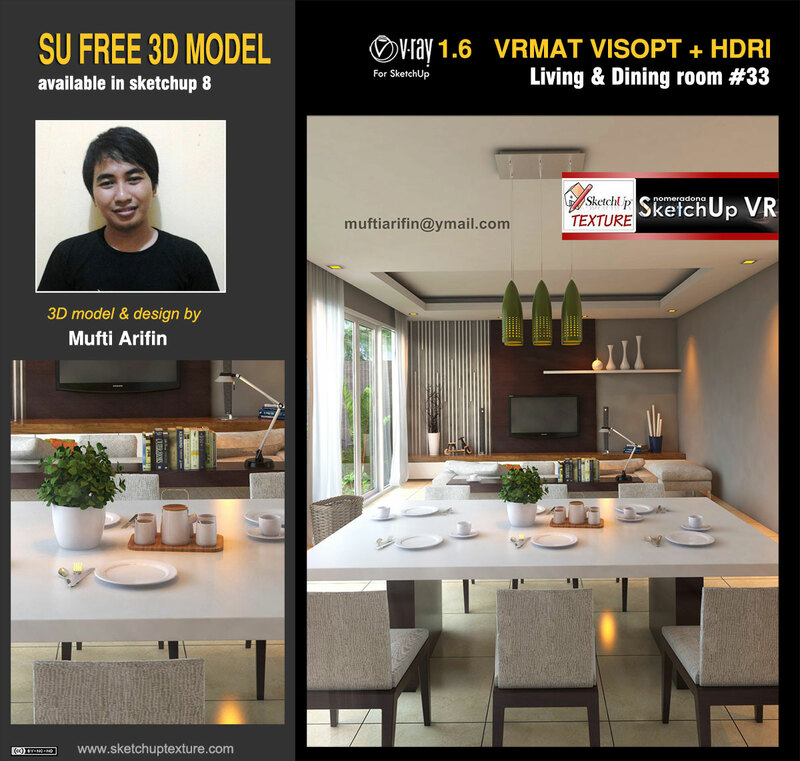 Fantastic new sketchup 3d model of today, courtesy by archt Mufti Arifin (You can contact him by clicking on its name) who shared with us his project of this modern dining and living room available in sketchup 8, complete with all the textures, and a very awesome vray Visopt , Vrmat, and HDRI , ready to be rendered with vray 1.6. Thank you so much for this excellent contribution to our community ! 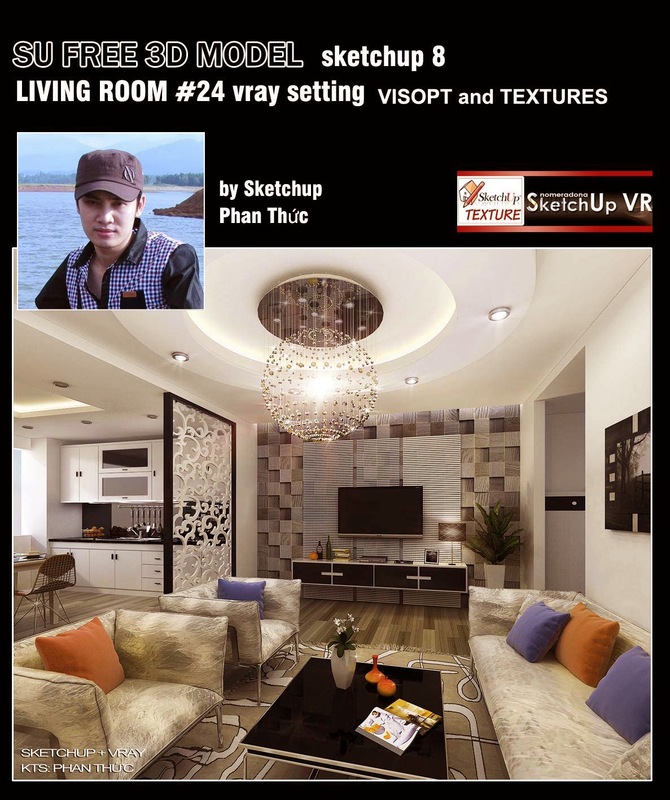 The apartment was initially consists of 2 bedrooms, 1 kitchen, a large entrance hall, a living area, in common with the 'dining area, and two small bathrooms, one of which was really very small. 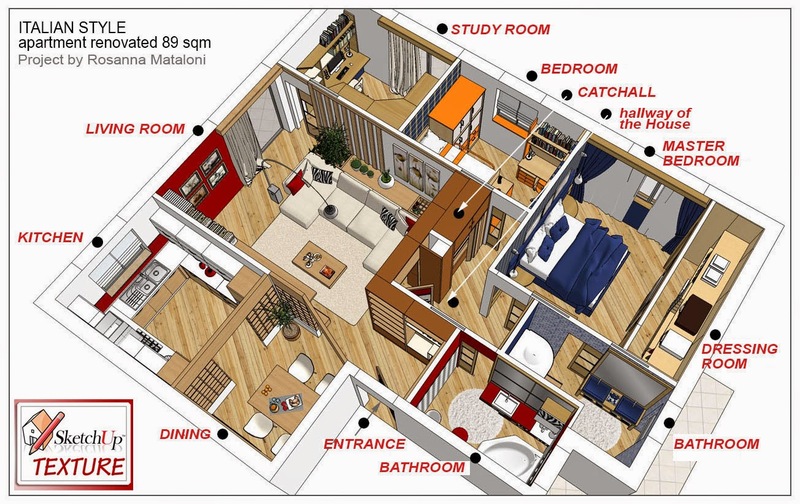 The customer wanted give the apartment a modern impact with the addition of an extra bedroom for studio use, with a bed of emergency, without having to give up a spacious living area. In addition, he asked that both bathrooms, they could have all the amenities. And here is the project of Rosanna Mataloni that after two years, we can share with the client's permission. We specify that all the furnishings used here were constructed tailored because being the apartment, part of a building, there were constraints to be respected, for example, the windows, it was not possible to move, close or open in a new location, the central pillar, and 2 load-bearing walls. - a dining area with round table in solid wood with elegant upholstered chairs. - a living area, furnished with the famous sofa FLEXFORM Groundpiece, Designed by Antonio Citterio and released in 2001, the Groundpiece sofa is a very versatile contemporary seating systems that allows you to build a grid based sofa as big or as small as your require. The first and most obvious reason behind its success is of course its simplistic beauty. Many would consider a minimal design like this to be easy to accomplish but getting the right proportions is often the foundation for a good design. 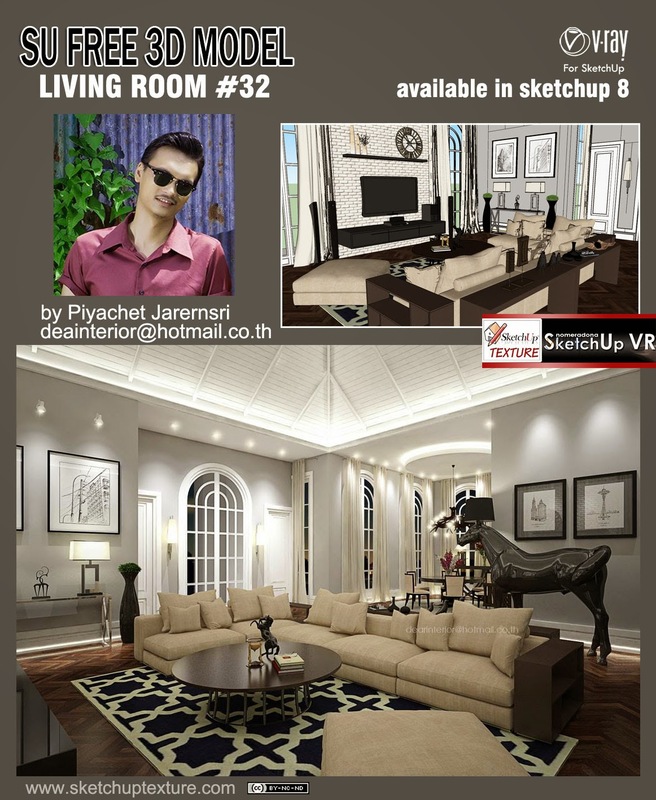 we thank you very much the architect Fakar Suhartami Pratama, for sharing this wonderful sketchup 3d model, who once again demonstrates his great talent, such as interior design and 3D visualization. Nothing is left to chance in this project, every detail is attended to with the utmost attention and shows a great ability to coordinate colors and materials, with the result of an elegant atmosphere welcoming. 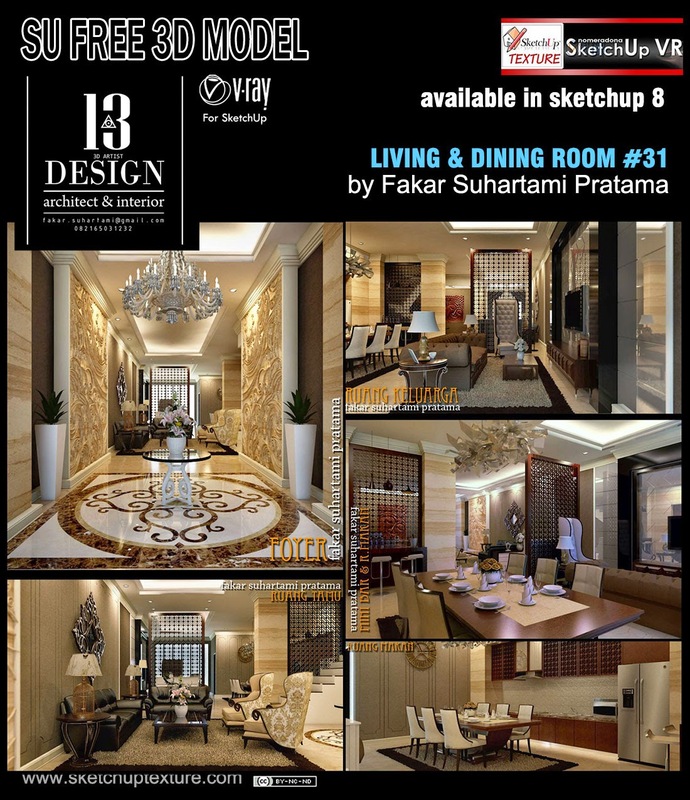 Those who wish to contact Fakar can do so by clicking here, visiting the gallery of his work on his website. 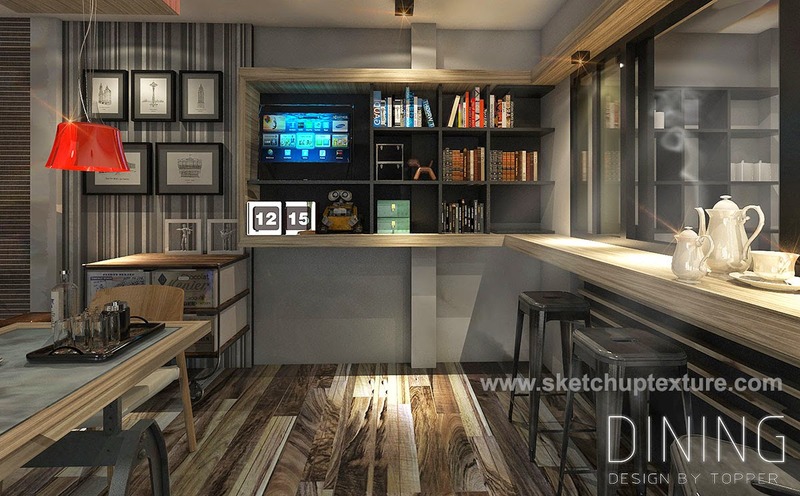 Really awesome, this 3d model, modeled in sketchup, 2013, by Duc Long (from Hanoi Vietnam,You can contact him by clicking his name) and rendered with vray 1.6. 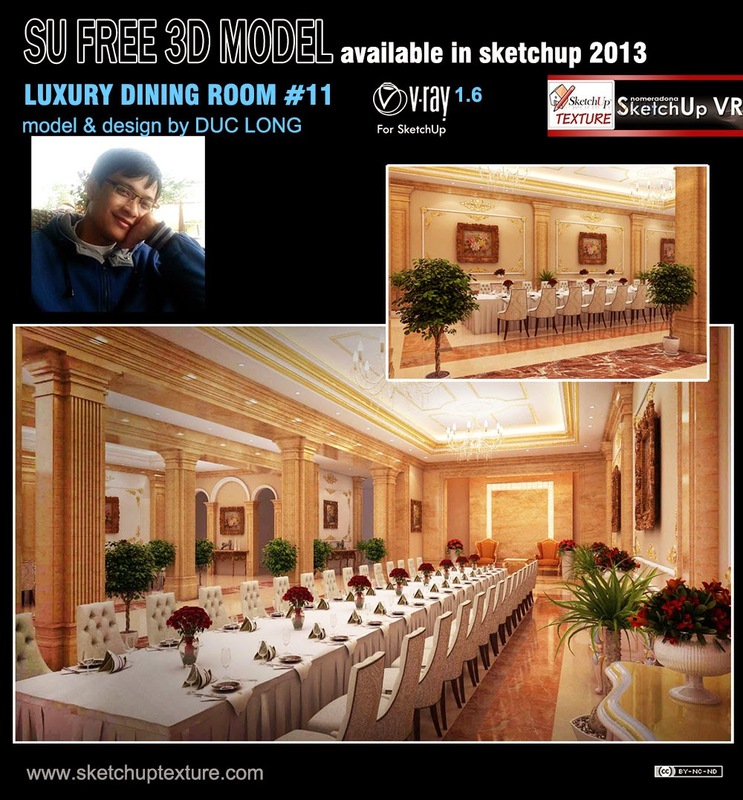 The 3D scene, represents a luxurious dining room of the classical type, with significant architectural details. The large table with important high-back chairs, dominates the central part of the room. The model is complete with textures, IES light, and ready to be rendered with vray 1.6. TAKE NOTE HERE OUR DISCLAIMER ! There are no words to comment on this masterpiece! 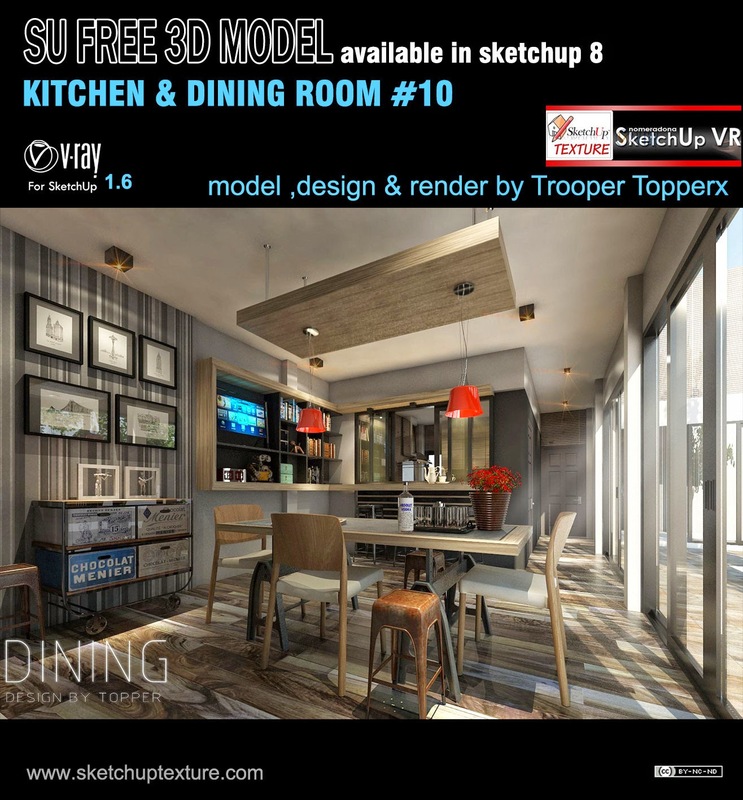 Looking at the meticulous research of detail and textures emerges immediately the deep passion that Trooper Topperx has, for the 3D visualization, but it is also evident the ability to combine color and to assemble the styles with absolute balance. 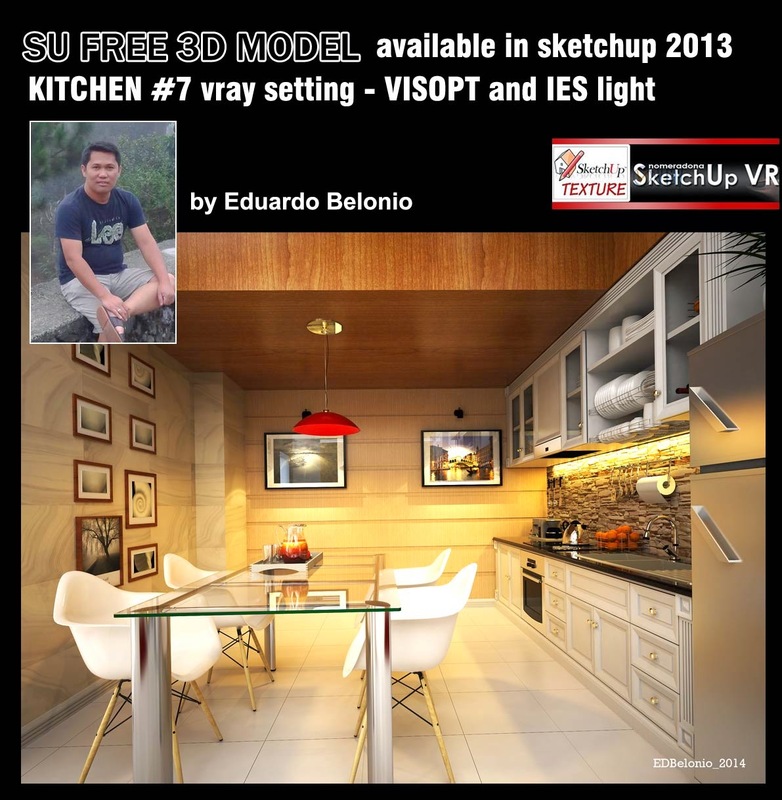 The 3d model, created and shared in sketchup 8, is a dining area, where the background you can see the kitchen. Contemporary elements are associated with old furniture and the atmosphere that reigns here is really wonderful. 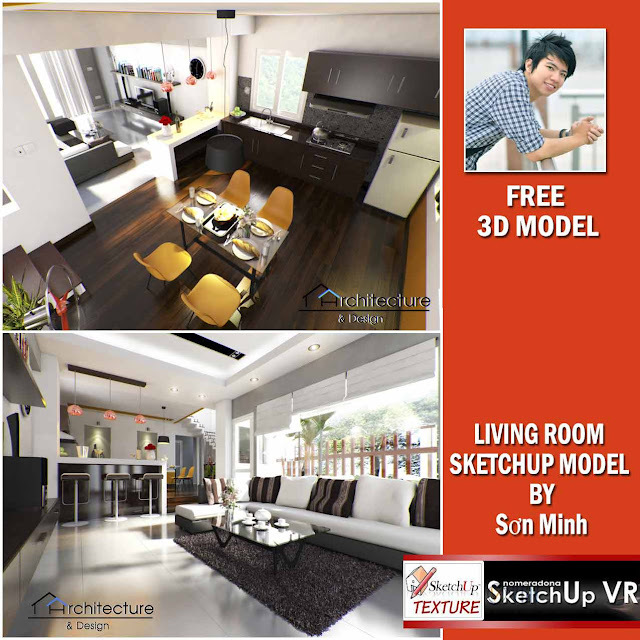 Congratulations from all the team of sketchup texture. 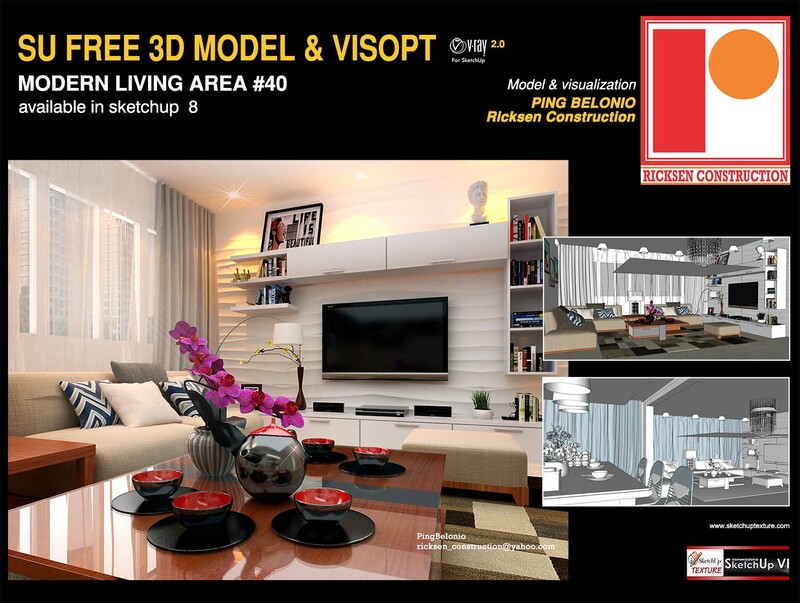 Very particular this great 3d model, characterized by a modern wood panel cantilevered with geometric designs. The 3d model that we share today, is a great contribution of the architect Dao Tuan Anh (You can contact him by clicking on the his name) who lives and works in Hanoi, Vietnam. 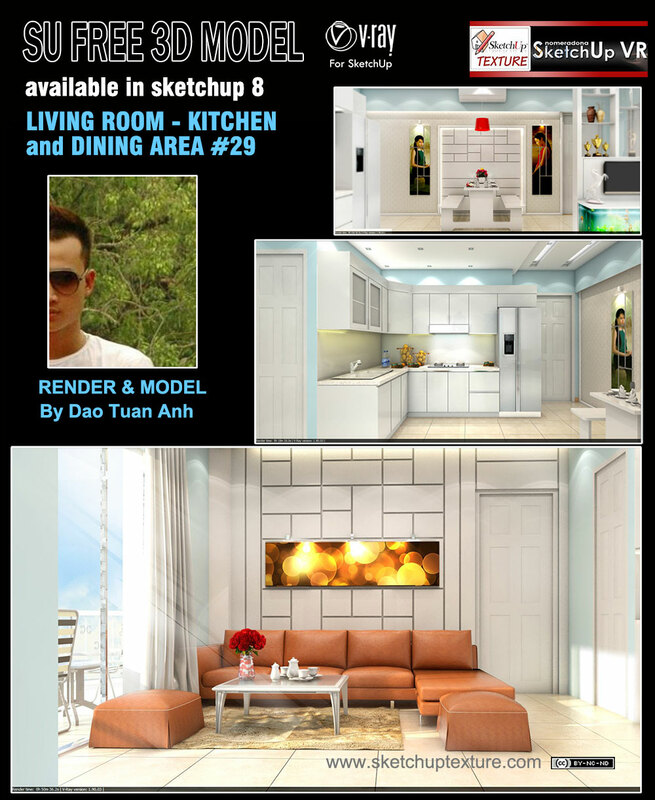 The 3d scene includes a living area with a large glass door access to the veranda, a nice dining area with a table and benches, and a modern corner kitchen in white lacquer. 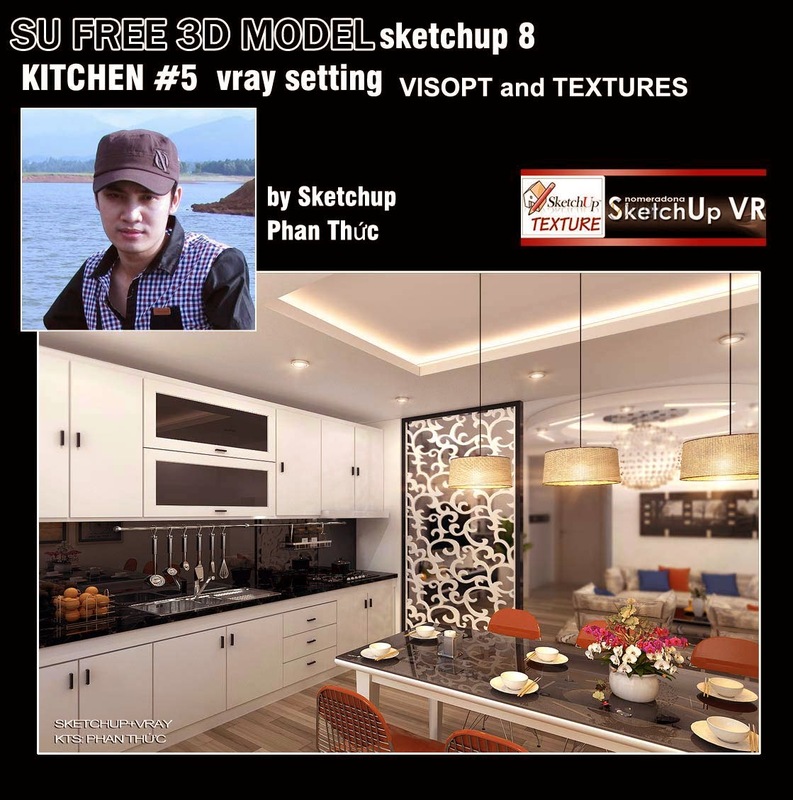 this great 3d model of kitchen with dining area, available in sketchup 2013, complete with all the textures, Visopt, Ies light, and ready to be rendered with vray for sketchup. 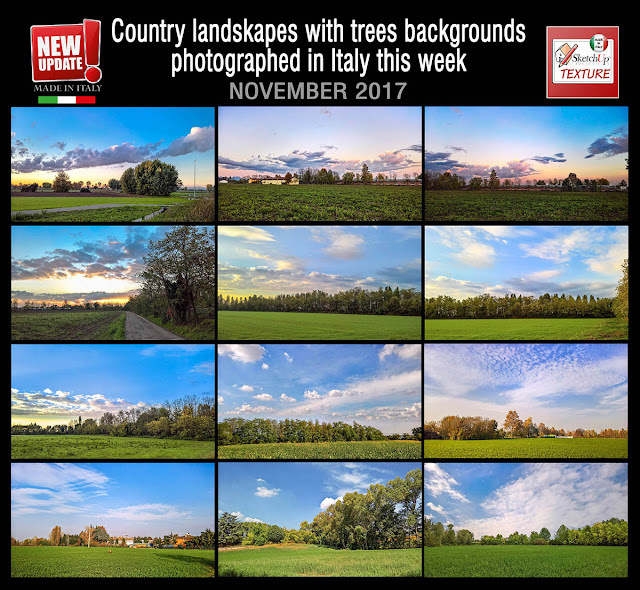 When you open the file, you will be surprised from the careful attention to detail but also by the excellent arrangement of the layout. The kitchen area is spacious and comfortable, stylistically well-coordinated. The table for 6 people, located on the right wall has been expertly rendered optically lightweight with the insertion the glass top. 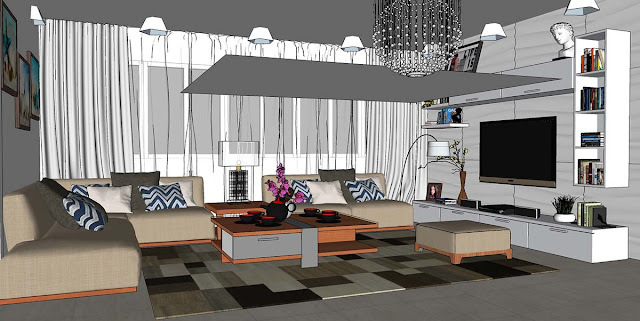 This arrangement makes the environment visually more spacious. 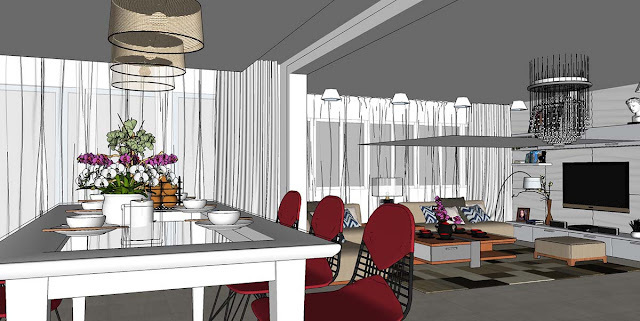 The living area, ideally separated from the kitchen, with a wood perforated panel, blends perfectly into the scene and to for the choice of colors and for the choice of the models: the armchairs and sofa, have a lightweight structure whose function is to give the room a feeling of spaciousness and lightness. 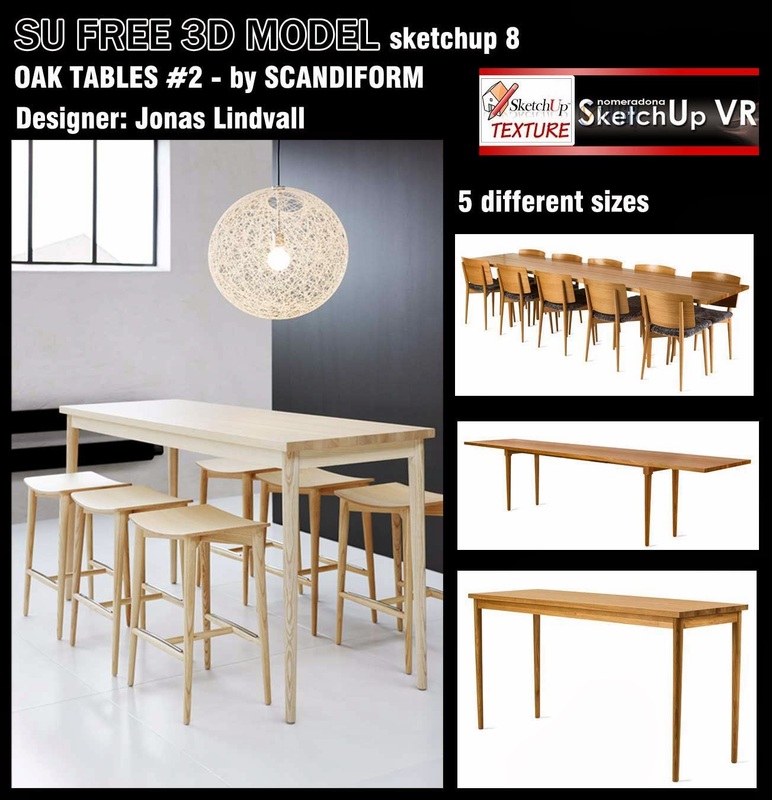 Here is a series of 5 beautiful tables of different sizes, made of oak, produced by Scandiform, designed by famous Swedish architect Jonas Lindvall, which reflect the interior design trends of the moment. The 3D scene modeled in sketchup , complete with textures and Visopt , ready to be rendered with vray 2.0 , reproduces a luxurious and refined dining room in classic style. Is surprising the attention to detail of this scene where every element has been chosen with care: white and brown are two colors in which declines throughout the scene giving it an elegant simplicity that eases the massive importance of the table, fully equipped , which dominates the central part of the scene. 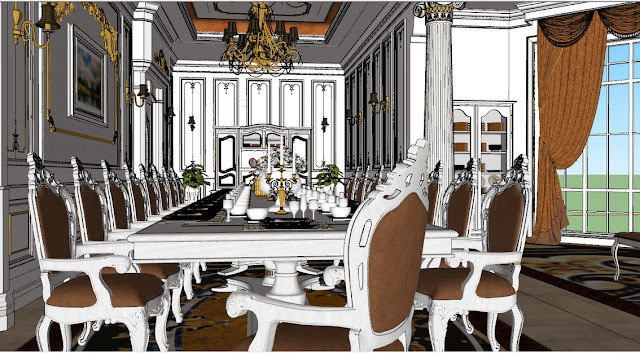 All 3d components, the chandeliers, the appliques, the stuccoes on the walls, the armchairs , the furnishings , the chandeliers , the curtains, and the piano on the right, all seamlessly integrated with a decidedly refined impression inserted into a bright and welcoming. 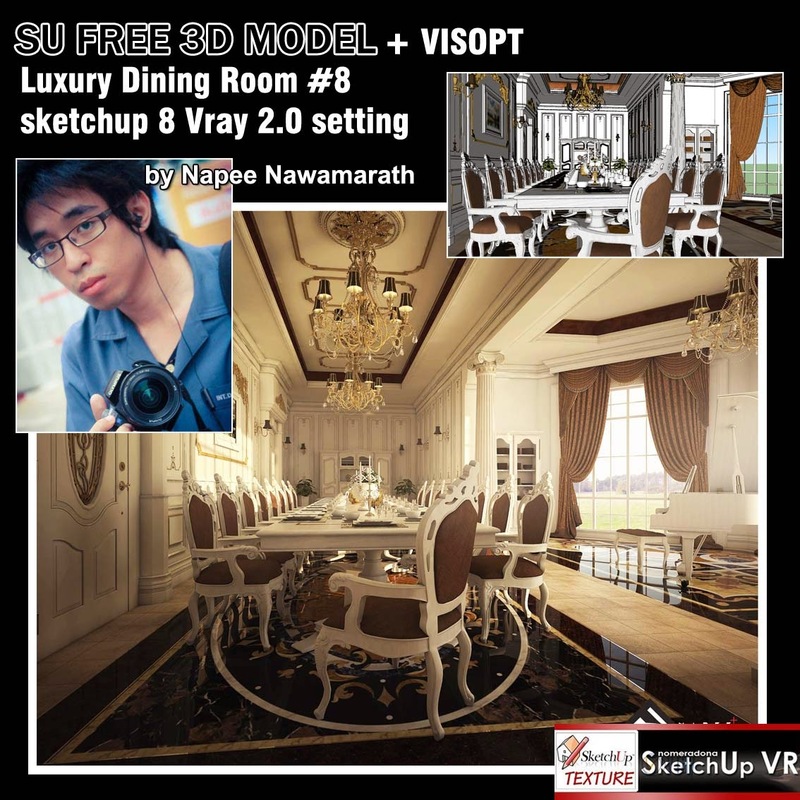 A big thanks to Napee for this excellent contribution to the sketchup community ! 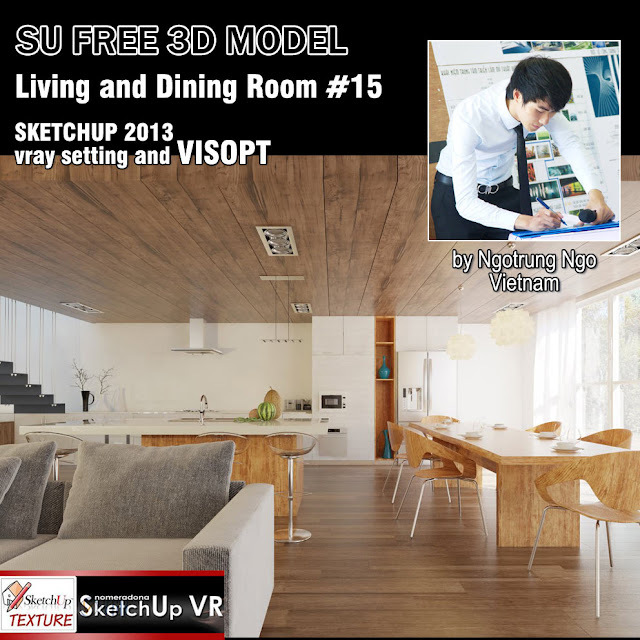 Another stunning 3d scene of our friend architect Ngotrung Ngo from Vietnam, which represents a living area, a dining area and a modern kitchen that we can see in the background. Excellent pairing of wood with white walls give us a warm and welcoming functional at the same time. The model, made in sketchup 2013, is full of texture and VISOPT ready to be rendered with vray. NOTE for the setting of the shadows in sketchup is to be modified as follows: time 11h: 55 am'' - date and month 19/5. 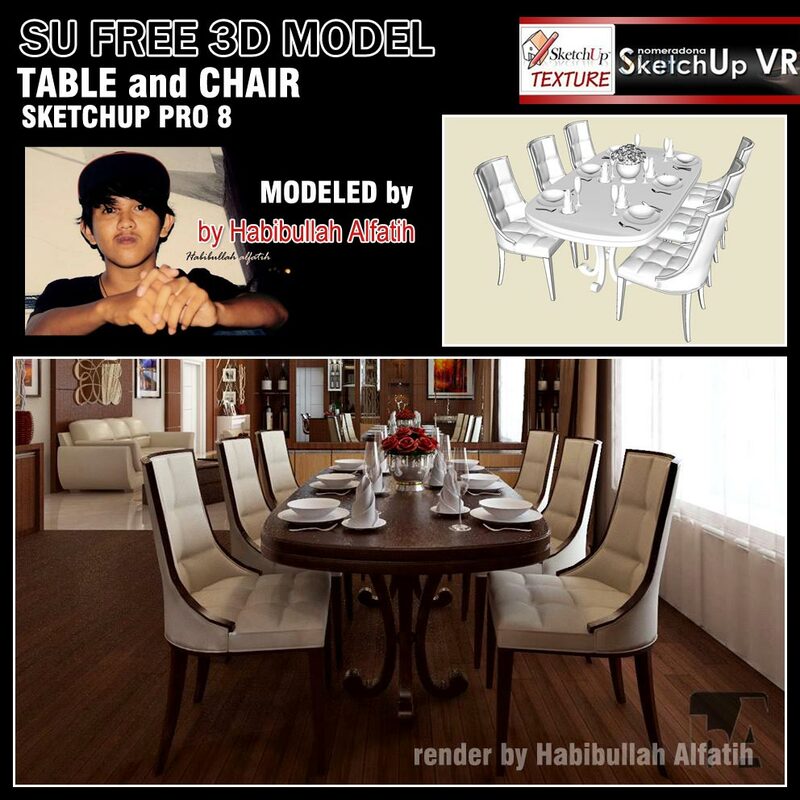 Really excellent this free 3d model coming from Indonesia modeled and shared by our friend Habibullah Alfatih. It is a classic table in solid wood , fully prepared, complete wit h 6 beautiful chairs design, with wood structure with upholstered seat and back and lined with fabric. Thank you so much for this contribution ! Lucas asks us also to thank his mentor Guilherme Andrade, training vray for sketchup METRO 3D, which has guided him for the realization of this scene, thing that we do willingly. A big thank you to our friend for his generosity from all of us !